An eight-minute travel rule on rural retained firefighters needs to be “brought up to date” to allow more men and women to join up. The comments were made in light of fears one of the fire appliances in Lochaber would be removed from active service due to lack of staff. For decades, recruitment has been restricted to volunteers who live within eight minutes of the base they want to join – in this case, Kinlochleven. But critics argue in the days of long commutes and less people working near where they live, people living outside the eight minute travel zone should be allowed to join the retained crew. Councillors in Lochaber have challenged the fire service to “think again”, after the rules on travel times set in the post war era means potential retained duty firefighters can’t work with the service. A large proportion of Scottish Fire and Rescue Service (SFRA) call outs in the Highlands are to road accidents. Of the 6,196 firefighters in Scotland, more than half are retained members of staff or volunteers. The majority of retained firefighters are in the Highland and Islands. 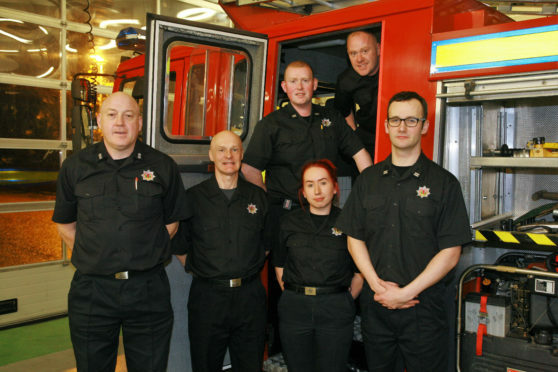 A council meeting last week heard potential firefighters are ‘clamouring’ to join up – but because they live in Glencoe, and not Kinlochleven, the few extra minutes to the appliance station rules them out. Lochaber area chairman, Councillor Andrew Baxter agreed, he said: “This isn’t just a story for Lochaber – it is a story for the whole of the Highlands. “We need to think about rules that were set in the 1940s that are hampering the fire service in the rural Highlands. “I have concerns about encouraging people to rush to the fire station along roads that are often tight and narrow. What we need is to perhaps have a second smaller response unit that is kept in another area. “In this case that could mean one in Glencoe where people can get to the appliance within eight minutes. Otherwise the time needs to be increased. Rab Middlemiss, local senior officer for the Scottish Fire Rescue Service for the Highland area, said: “We have, and continue to, engage with all of our communities in Lochaber, driving forwards recruitment initiatives at all stations including Kinlochleven. “There is no doubt that recruitment can prove challenging and that is for a number of different reasons including the fact that people no longer work in their home towns. He continued: “Our retained firefighters are stand at the heart of the communities they protect. “Every potential recruit is considered on their individual merits, including the time it would take for them to travel from their home or place of work to the station when called upon. He confirmed there were no plans to close or move Kinlochleven. To sign up to become a retained firefighter visit www.firescotland.gov.uk/work-with-us.